The cyclist known as Rhino – Simon Van Velthooven - charged through a world class field to claim an exciting keirin final at the BikeNZ national track cycling championships in Invercargill tonight. 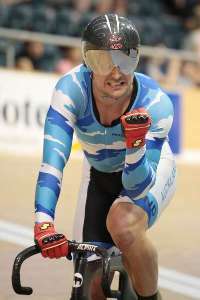 The London Olympic bronze medallist showed his fighting qualities, to force his way around a superb field and hold off the challenge from the super-slick Sam Webster by the narrowest of margins in front of a packed house at the Stadium Southland Velodrome. It highlighted another superb night of finals with Southland’s Natasha Hansen producing her best to win the women’s keirin final, Olympic medallist Aaron Gate was supreme in the points race and Liz Steel outsprinted the bunch to claim the women’s 10km scratch race. The big crowd were treated to a magnificent keirin final which thrilled BikeNZ national sprint coach Justin Grace. “It shows we have a really good core group of five or six riders who can compete at the highest levels of the sport,” said Grace. “That was very high quality, high speed, great tactics by all the riders and a world class race. “It is going to be very hard to pick the riders to go to the world championships. The selectors have been asking a lot of pertinent questions and watching very closely this week. It’s going to be a tough job. Van Velthooven, a finalist in this month’s Halberg Awards, said he great enjoyed the race. “I thought it was a fantastic final and not just because I won. It wasn’t an easy race. We are good friends off the bike but enemies on the bike. “The sprint started 600m out and everyone wanted it. It’s nice to beat them when they all have such good form. Southland’s much-improved Matt Archibald held on for third place ahead of Eddie Dawkins, Tom Beadle and Ethan Mitchell. 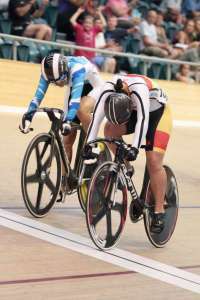 The women’s keirin provided a chance for the Olympic sprinter Hansen a final chance for an individual title. She has finished second fiddle to fellow Southlander Stephanie McKenzie in the sprint final and second and third respectively in the 500m and 250m time trials to New Zealand teammate Katie Schofield. She showed her class to claim her first title of the championships with a convincing display, moving to the front midway around the final lap and controlling the sprint. World junior championship medallist Paige Paterson, in her first venture into the elite ranks, impressed with a fast finish to claim second. Steel produced the best of the bunch sprint to claim the 10km scratch race from Auckland’s Raquel Sheath and Wanganui’s Cassie Cameron after young Aucklander Georgia Williams had twice tried to solo away from the field. Gate (Auckland) has been in a class of his own in endurance events at the championships. He dominated by winning four sprints on his way to claiming the points race title over 30kms to finish on 39 points, well clear of fellow Olympian Shane Archbold (Timaru) on 23 and Invercargill’s Piet Bulling on 15. It completes the treble for Gate who won the individual pursuit and scratch race titles. Tomorrow’s final day of racing features the team sprint, men’s Madison and under-19 team pursuit and team sprint. Men keirin semifinal1: Simon van Velthooven (Auckland) 1, Ethan Mitchell (Auckland) 2, Matt Archibald (Southland) 3. Semifinal 2: Sam Webster (Auckland) 1, Eddie Dawkins (Southland) 2, Tom Beadle (Southland) 3. Final: Van Velthooven 1, Webster 2, Archibald 3, Dawkins 4, Beadle 5, Mitchell 6. Women keirin final: Natahsa Hansen (Southland) 1, Paige Paterson (Auckland) 2, Elizabeth Steel (Canterbury) 3. Women Scratch race 10km: Elizabeth Steel (Canterbury) 1, Racquel Sheath (Auckland) 2, Cassie Cameron (West Coast North Island) 3. Men points race 30km: Aaron Gate (Auckland) 39 points, 1; Shane Archbold (Mid South Canterbury) 23, 2; Piet Bulling (Southland) 15, 3. Women sprint. Gold medal: Nina Wollaston (Auckland) bt Ruby Perry (West Coast NI) 2-0. Bronze medal: Maxyna Cottam (West Coast NI) bt Samantha Croft (Auckland) 2-0. Men sprint, gold medal: Zac Williams (Auckland) bt Jeremy Presbury (Southland) 2-0. Bronze medal: Chad Elliston (Auckland) bt Quinn Karwowski (Tasman) 2-1. Men points race 20km: Regan Gough (East Coast NI) 26 points, 1; Liam Aitcheson (Southland) 14, 2; Josh Haggerty (Southland) 12, 3. Women points race 15km: Holly Edmondston (Canterbury) 14 points, 1; Alice Hay (Canterbury) 11, 2; Maxyna Cottam (West Coast NI) 9, 3.